There’s nothing new about worry lines, frown lines, crow’s feet or other wrinkles caused by smiling, laughing or frowning. There is a very effective new way to treat them. It’s called Botulinum Toxin, which is the name of a product used for a variety of medical conditions licensed for muscular disorders for more than 10 years. 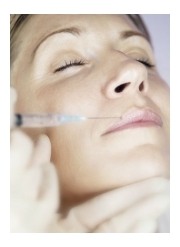 Using a micro-needle, minute amounts of Botulinum Toxin are injected into specific facial muscles. It relaxes those muscles and stops them forming lines and wrinkles, resulting in a more youthful and pleasing appearance. The effects of the injections can last from two weeks to six months, but most people notice that the effects start to wear off between three and six months after treatment. The more injections you have, the longer the effects last, as the muscles begin to thin. This is a long lasting gel which is very similar to one of the body’s own natural substances (hyaluronic acid) which makes it a completely safe way to fill out the natural lines and wrinkles which occur when the skin loses some of it’s natural plumpness. Dermal fillers are a much safer way to smooth out fine lines and wrinkles. Like Botox, there are injections involved, but Dermal fillers are non toxic. After the age of around twenty-five, your body starts to produce less of this, which is when fine lines and wrinkles start to emerge. Hydraphil injections maintain your body’s production of hyaluronic acid, which reduces the ageing signs. Both treatments are relatively painless. We use very fine needles to minimize the discomfort and bruising. You shall have a comprehensive history taken of any pre-existing medical conditions which can affect the administration of treatment. Your dentist will advise you during the initial consultation.